The Indian Rupee has fallen in value against a basket of currencies since independence in 1947. In recent years, the Indian Rupee has continued to depreciate in value. In 1990, you could buy $1 for 16 Indian Rupees. By 2013, the value of a Rupee had fallen, so that you would need 65 Indian Rupees to buy $1. 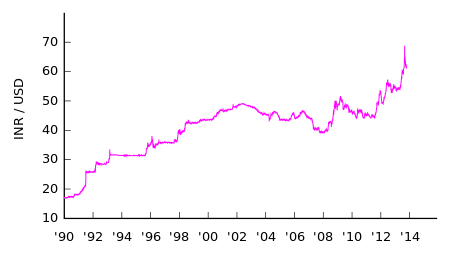 This shows there has been a substantial fall in the value of the Indian Rupee against the US dollar. When there is a devaluation in the Indian Rupee it means that Indian exports become cheaper, but imports are more expensive for Indians to buy. In particular, a devaluation of the Rupee is bad news for Indians who need to import raw materials, such as oil and gold. Lack of competitiveness/inflation. The long-term decline in the value of the Rupee reflects India’s relative decline in competitiveness. In particular, India has a higher inflation rate than its international competitors. In November 2013, Indian inflation reached 11.24%. Therefore, there is relatively less demand for the rising price of Indian goods; this reduction in demand causes a fall in the value of the Rupee. Current account deficit. A consequence of poor competitiveness and high demand for imports is a current account deficit. This means India is purchasing more imports of goods and services than it is exporting. A large current account deficit tends to put downward pressure on a currency. This is because more currency is leaving the country to buy imports than is coming in to buy exports. In the first quarter of 2013, the Current Account Deficit was 18.1 billion. The deficit was over 6.7% in last quarters 2012; the deficit has fallen to 1.2% in Q3 2013. However, the Economist notes that 75% of the deficit reduction is artificially related to reducing imports of gold through government restrictions. (See: Indian economy 2014) Therefore, there is still an underlying trade deficit, India will need to work on through increasing exports and competitiveness. A current account deficit can be financed by capital inflows (on the financial account). But, recently, India has been struggling to attract sufficient long-term capital investment. Some major companies have recently pulled out of foreign direct capital investment. This puts more downward pressure on the Rupee. India is a net importer of oil. It has to buy oil in dollars. Therefore, rising oil prices worsen India’s current account and also weaken the Rupee. More Indian’s rupees have to be spent on buying oil. Inflationary pressures. India is trying to control inflation, which has been running into double digits. But, devaluation makes itself makes it harder to control inflation. The devaluation increases the price of imports, such as oil and fuels, leading to cost-push inflation. Also, devaluation is considered an ‘easy’ way of restoring competitiveness. Therefore devaluation may reduce the incentives for exporters to work on improving long-term competitiveness. Finally, devaluation can help boost domestic demand. Exports will rise and consumers will switch to domestic producers rather than imports. This can cause demand-pull inflation. A devaluation can boost domestic demand and short-term economic growth. However, this is not necessarily helpful for the Indian economy. India’s economy needs to concentrate on boosting productivity and long-term productive capacity, rather than relying on boosting domestic demand. The rapid devaluation has also caused a loss of confidence in international and domestic investors. With a history of quick depreciation, foreign investors will be more nervous of investing in India. The devaluation and inflationary impact will also discourage domestic investors, e.g. firms worried about future oil prices. This reduction in investment is damaging to long-term economic growth. The concern is that high Indian inflation causes devaluation, which in turn feeds into more cost-push inflation. Thus it becomes a difficult to escape out of this unwelcome negative spiral of inflation-devaluation-inflation. Reduce dependency on foreign oil, through domestic and renewable energy. Monetary policy to tackle inflation and reduce domestic demand. But, will conflict with lower economic growth and lead to higher unemployment. Financial controls, e.g. limiting the amount of gold imports to reduce the current account deficit. Does a devaluation really help an economy? Note on terminology: In strict terms, we should refer to the depreciation in the Indian Rupee. A devaluation means a fall in the value of a fixed exchange rate. But, in practical terminology, the distinction between depreciation and devaluation is often blurred. This entry was posted in A-Level, currency and tagged exchange rate, india. Bookmark the permalink.